It’s Wednesday evening here in India and we’ve had the day off in celebration of Ghandi Day! Tyson and I have had quite a relaxing day together watching t.v. and just enjoying each other’s company. Tyson had his second procedure yesterday which was a shot in the base of his spine. Typically this isn’t painful at all for him, as crazy as that sounds…but in any case, yesterday’s was a bit painful for him. He ended up in bed for the remainder of the afternoon and into the evening. I sat him up for dinner but he was so uncomfortable, I just ended up laying him back down. Today, he woke up feeling much, much better! Tyson had his first procedure last week. He had an epidural catheter (which stayed in for 3 days this time) and a wrist block for both wrists. The following day in Occupational Therapy, we noticed Tyson’s left thumb move! So amazing. His therapist, Swati, also said recently that his hands feel lighter, meaning he is putting in more effort to hold them up which is so great to hear. She had him practice writing the other day with a marker and he actually did quite well! He was able to write his first and last name, the date and a funny face. Because he had the catheter in for 3 days, he hasn’t actually walked much yet. However, it’s important to know that he stands nearly every day which is supremely beneficial for him. 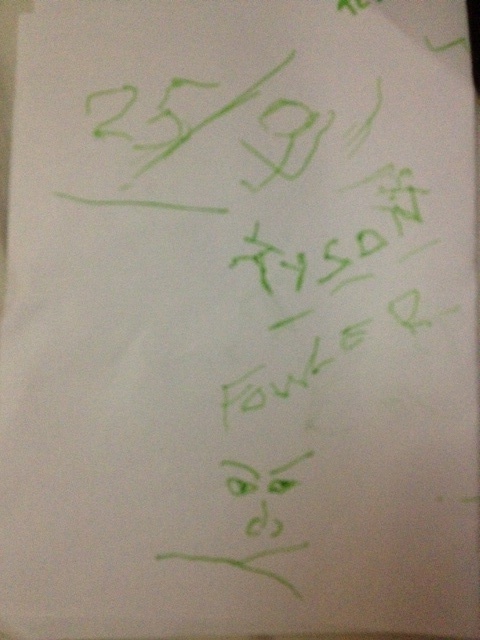 Straight away, his therapist, Dipin and I noticed that Tyson is standing straighter and with more ease and confidence. He doesn’t seem as nervous or shaky as he’s been in the past. As with everything else…we’ll get there when he’s ready. This week, Tyson mentioned that he wanted to switch out his wheels for his lighter, manual wheels so that he could work on strengthening his upper body more. He figured he may as well try it here in the hospital where the distances from one place to the next are shorter and if he gets tired, I’ll be there to take over and push him. When we leave the hospital to go to the market or anywhere else, we’ll switch the wheels back. With the consent of his therapists, I swapped his wheels for him. We had left them here in August, knowing we wouldn’t need them at home and that we would be back in 6 weeks (I had enough to drag through the airport…it was refreshing to lighten my load a bit). The tires were pretty flat, so the ward boys brought the tire pump up to the lobby and hooked him up! I removed the joystick from the arm of his chair and detached the battery back from below his seat. The battery itself weighs almost 10lbs and the motorized wheels are roughly 25lbs a piece. Removing these from his chair and adding the manual wheels (which I can literally lift with one finger) make his chair pretty easy to maneuver. Having said that, it’s still an enormous struggle for him. His hands don’t work, so he has to position his palms on the rubber rims just right to get the leverage he needs to propel himself forward. I help him with his turns and when he needs to go in reverse. It’s very frustrating for him and he gets tired quickly from it, but the bottom line is that he’s trying. Even if he pushes only 5 times in an entire day, it’ll count for something. We made friends with a patient and his mom who are here from Dallas, Texas. A couple times a week, she and I head over to Greenpark Market which is about 2 blocks away to pick up supplies. Usually I grab 2-3 cartons of vanilla soy milk and some cookies. On our most recent trip to the market, Swati had asked me to pick up some play-doh for Tyson’s OT session (for strengthening his fine motor skills). I went into a small toy store which was literally packed to the ceiling with toys and games. I didn’t put too much effort into looking for the play-doh because I probably would have ended up standing there for an hour looking for it. The gentleman behind a heap of toys at the counter asked how he could help and I told him what I needed. He knew right where to find it. As he pulled it out of the wall, I sort of imagined the entire store collapsing like a giant Jenga puzzle, but nothing budged 😉 Before heading back to the hospital, I stopped at a newspaper/magazine stand. The September issue of Vogue India caught my eye. I picked up a copy and asked the man “how much?” He said, “150”….150 rupees?? That’s under $2.50. At home, A Vogue magazine can be as much as $6-$10. So I looked a bit more and the guy handed me India Harper’s Bazaar and India Elle. I also grabbed a copy of Hello magazine because Katrina Kaif, a very famous Bollywood actress, graced the cover. The total came to around 500 rupees. I was one happy girl! Anyway, it’s bedtime here and as always, we are looking forward to a new day! There will be much more to come soon! He can do all things through Christ who strengthens him. God Bless Tyson, you and Cal. Love you all!